ChairScholars Foundation Scholarships are offered to low-income students under 21 who are severely physically challenged. Impairments can include hearing impairment, visual impairment or physical disability. Three different scholarships are available. They include the Florida Scholarship Program for students living in Florida who are in grades 7 to 11 and currently attending public school who have a physical disability. The scholarships can be used for college or vocational school with Florida Prepaid Tuition Scholarships. A B grade point average is required. The ChairScholars National Scholarship Program is for seniors in high school with severe physical challenges to attend any college they choose, and the scholarship is renewable up to four years. It is for undergradate school. A B grade average is necessary. The New York Metropolitan Scholarship Program offers scholarship opportunities for high school seniors or college undergraduate students in the New York Metropolitan Area who have severe physical impairments. A B grade average is required. 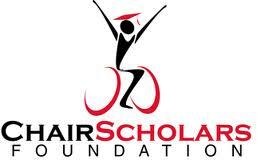 ChairScholars Foundation is a non-profit organization founded 20 years ago and is headquartered in Odessa, Florida. The purpose of the organization is to provide scholarships to students from low-income families who have severe physical handicaps to enable them to attend college.